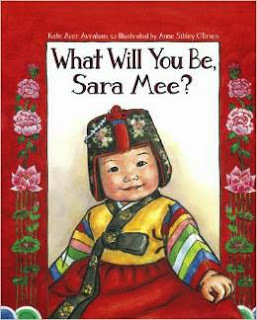 We have a reason for collecting books about S. Korea in our household. We've adopted twice from this beautiful country and one of the ways in which all of our kids feel connected to the country is by learning about it is through books. (We'll take them to visit as they continue to grow up.) I've been building our collection of such picture books for many years now and thought I'd share a few of them with you. These titles have been spread all over our coffee table of late as we've been pouring over them yet again. First, I purchased South Korea (Country Explorers) just so that the kids would have a general understanding of the culture. Filled with illustrations alongside full-colored photographs, this book gives a decent overview of South Korea. It provides a topographical map and talks about how S. Korea is part of a peninsula. There is a discussion with pictures about S. Korea's many beautiful islands and their mountains. * The book contains paragraphs of information on the Korean alphabet, different customs and celebrations, pictures of Korean food (which we drool over ever time we see it), a short description of general family life, and a discussion of the religions most practiced. This book is 45 pages long but with only two paragraphs (give or take) of information per page spread, it makes for easy, fun reading. When we visited S. Korea, we went on a day trip to Yeouido Island in Seoul. Linked to our family's travelogue. Read about that trip (and others) over on Tea First. The Trip Back Home was a suggestion I picked up from Goodreads. We just recently added this one to our collection. 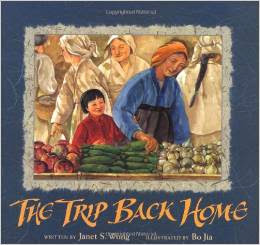 The book is written by Janet S. Wong and the story is inspired by her own trip to rural S. Korea "many years ago." (It doesn't say exactly how long ago.) In this story we meet a little girl who travels to S. Korea with her mother to visit her mother's parents and sister. They spend some time in country, experiencing life in a rural village. She enjoys her time with her haraboji (grandfather) and halmoni (grandmother) doing work around the house and, of course, cooking. In short, this is a very sweet story about family. Even though the cultures they live in are different, they still love each other and enjoy the moments that they have with one another. Highly recommended. If you want to explain more about this one year old birthday custom, this is a great book to consider. For my own son's first birthday, my mom choose an extremely thoughtful gift of a set of the following books of Korean folktales, retold by Dongwol Kim Roberson. (My mom even obtained Roberson's autograph in each of the books!) These stories don't quite run like the fairy tales we're used to with Disney princesses dancing about. Characters can meet with bad endings if they do not behave themselves. 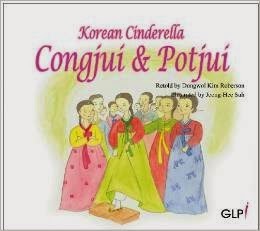 Congjui & Potjui is the S. Korean version of Cinderella. The story follows along similarly to the one we are all familiar with except in this one there is a Heavenly Maiden which appears to Congjui instead of a fairy godmother. Also, Congjui loses one of her beautifully embroidered gkotsins (shoes embroidered with flowers) while crossing over a stream instead of losing a glass slipper on palace steps. You'll find a few more dissimilarities but it's still the story you know. You might also know this story as The Green Frog (or The Little Green Frogs). 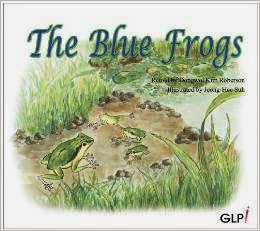 It tells the story of some froggy siblings who do exactly the opposite of whatever their mother tells them to do and, as the moral goes, they learned a hard lesson as a result. 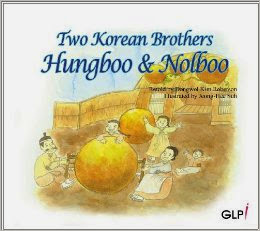 Hungboo & Nolboo (Two Korean Brothers) is a longer story and Bookworm1's (age 8) personal favorite. It tells the story of two brothers who both inherit their father's farm upon his death. The older son is very greedy though and sends the younger one away. The younger man's family struggles to make ends meet, but despite their own struggles they are kind and loving even to little sparrows. Their kindness is rewarded in a very surprising way (which I will not tell you about so that you will read it for yourself). Moral? Spread love, caring and kindness to family, friends, and others we meet in our daily life. 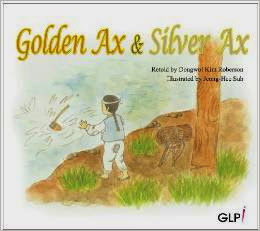 Lastly (for this post) there's Golden Ax & Silver Ax which tells the story of a poor, young woodcutter who accidentally loses his rusty ax in a murky lake. A Shilyongnim (wise old man) appears out of nowhere and offers to help him find the ax in the murky waters. First he "finds" and presents the young woodcutter with a golden ax and then a silver one, but the woodcutter denies that he owns either. He keeps insisting to the old man that his ax is just an old and rusty one. The old man smiles and gifts the woodcutter with all three axes: the gold, the silver and the rusty. Moral: One must live truthfully and honestly each day, then the reward in life will be great. These are all fun books to read and I'm glad to enjoy them with my children. We're always looking for new titles and if you have one to suggest, let me know in the comment section below! What a great way for all the family to learn more about the country and culture. Now I want to go out and buy all of those! We love: K Is for Korea (World Alphabets), Bee-Bim Bop! I love, love, LOVE this post and what it means for your beautiful family!